35 calories! I know, right? 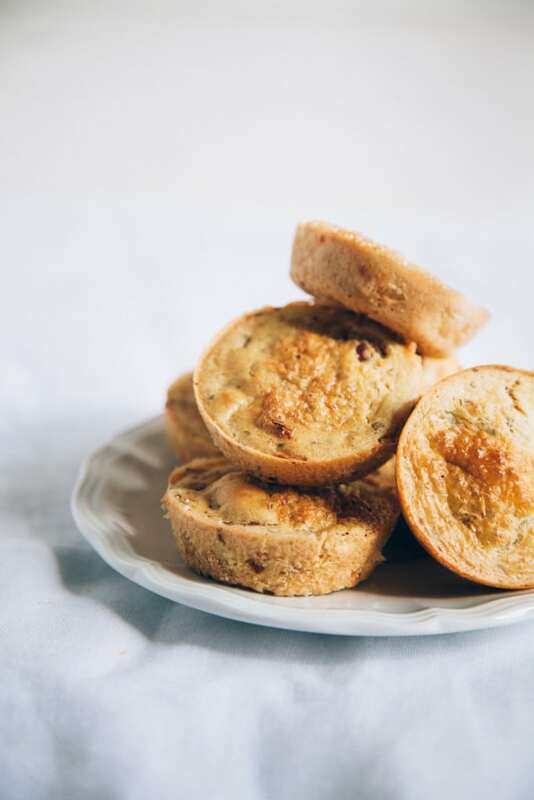 Not only are these mini quiches low calorie but they are fat-free, gluten-free, grain-free, vegan and a good source of protein. 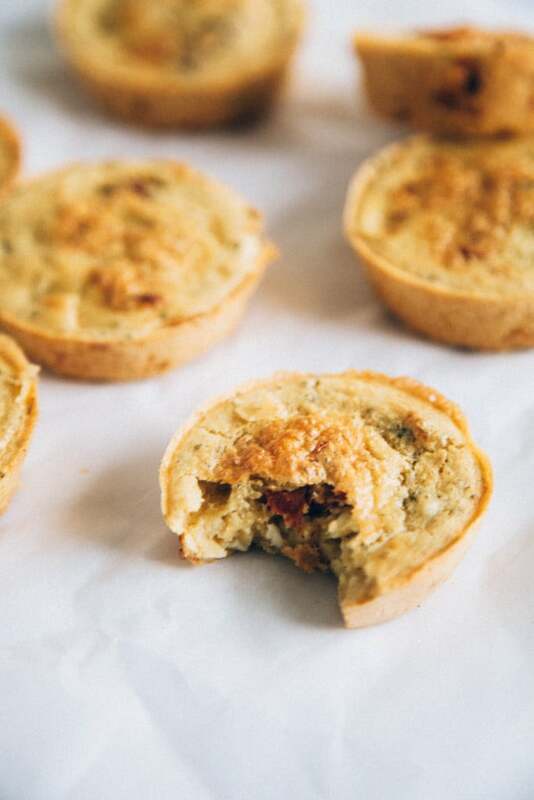 The sun-dried tomatoes give a slight bacon-y flavour, that reminded me of a quiche Lorraine. SO good. If you can get hold of smoked tomatoes -even better. Takes 8 mins to prepare and 20 mins to cook! So what are these mini quiches made of, if not eggs? The secret ingredient is chickpea flour. And don’t worry – this is a very easy to get hold of ingredient. It’s sometimes called Gram or Besan flour and can be found in Asian food shops or in the supermarket in the Asian food section. A bit like making socca, the chickpea flour is combined with water which creates a firm “cooked egg” texture. Combined with nutritional yeast and some black salt (if you can get hold of it) you can also create a classic egg taste too. 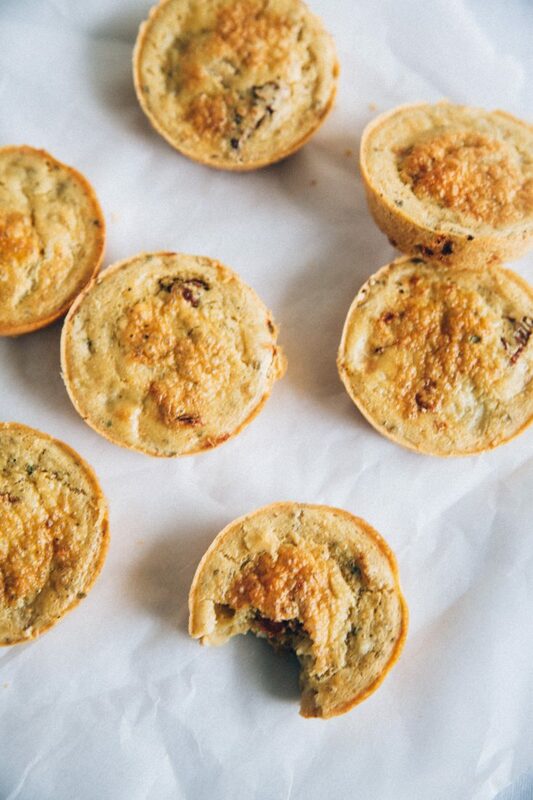 Mini quiches that are perfect for on-the-go breakfasts and snacks. Vegan, gluten-free, low-fat, low-calorie and virtually guilt-free! Preheat oven to 220C / 430F and coat a muffin tin with cooking spray. In a bowl, whisk together the chickpea flour, water, nutritional yeast, black salt, herbs and sun dried tomatoes. Coat a frying pan with some cooking spray and fry the onion and garlic for a few minutes until softened and beginning to brown. Remove from the pan and add to the bowl. Pour the mixture into the muffin tin. You should get 8 mini quiches. Bake for 15-20 minutes until the quiches are firm and browned on top. Serve warm, freeze for later or keep in the fridge for up to 5 days. Enjoy! *Black salt gives an "eggy" taste but is completely optional. **If using sun-dried tomatoes in oil, you can rinse them in water and use a paper towel to soak up any leftover oil. Lovely. I added green peppers, mushrooms in addition to the garlic and onion. oh and a bit of jalapeno also! I think they need a lot of salt. (not just the black salt) because otherwise they can be a bit bland. I made mine in mini muffin tins, and double the recipe but used 1/2 cup less water (1 cup flour to 1 cup water) and they were the perfect texture. Followed the recipe but mine came out tasting horrible with too much-dried herbs and too much nutritional yeast. I should have known better when the herbs were not specified -- a tablespoon of herbs is a large amount for such a small recipe. Reviews are all so great, I had to make these. But they were just ok. They tasted like spiced muffins. Nothing quiche-like. Not bad, but not good either. I probably won't make them again. Made these quiches for a staff potluck and they were gobbled up! Then went home and made another batch for my family. I added chopped up Tofurkey sausage to the second batch and will experiment with other additions. Thank you for providing such a fun, tasty — and easy — recipe! I just made these! I kept an open mind and I'm glad I did because I don't think they are particularly quiche like; they are little more dense. That said, they are delicious and very easy to make. The flavour is divine. I used Nacho Cheese Nutrional Yeast which I think helped with a mild Cheese flavour. I'll definitely be making these again tomorrow. 35 calories?! Whooooo! I made this 'correctly' twice. Today, I already have some leeks chopped so thought I would try those instead of onions as they are great snacking/portables. 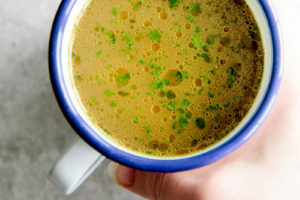 I don't have a herb mix... what do you recommend putting in if I am just using several different single herbs? Thanks! These are delicious! Thank you so much for the great recipe Aimee! I usually buy sundried tomatoes in a pouch already cut up. About how many cups does 8 sundried tomatoes make? Probably about a packed 1/4 cup based on my estimate from making these today. If you cannot find nutritional yeast in stores near you (it tends to be at health food stores), and you can't order it online, you can get regular activated yeast (for baking bread). What you do with that is you toast it for a few minutes on a dry skillet. This deactivates the yeast. Doing this doesn't have the same benefits as commercial nutritional yeast because commercial nutritional yeast tends to be fortified with vitamins. However, if you are in a pinch, this is a good method. I've had to do it before. First of all these are fantastic! So many things I'm thinking to throw in next time, spinach, coconut bacon, etc. BUT did I mess up? Mini quiche was I suppose to put them in mini cupcake pans? I doubled the recipe and it made only 11. Hello! I am a brand new vegan. I tried this recipe and didn't feel like it was a quiche, but more of a savory biscuit. I think this may be because I used the wrong nutritional yeast - Bob's Red Mill. I definitely want to try this recipe again with a different yeast. Could you recommend the one you use? This isn't the first time I have been disappointed by my choice. Also, I didn't use dried mixed herbs. 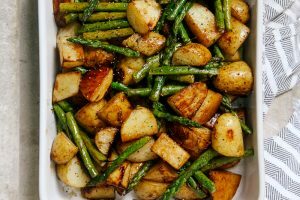 I used herbs de provence. Was I wrong? Thanks in advance for your help. These look delicious. I noticed one of the comments mentions about the problem of them sticking to the pan. I'm going to try and make them using my re-usable silicone cupcake liners since I've already ruined a couple of muffin pans with savory recipes (even though they were meant to be non-stick!). I love using chickpea flour, it's so good and nutritious. sundried tomatoes are a bit expensive for me - so I did try the recipe - and I did sub the tomatoes for canned, spicy crushed tomatoes. I think I underestimated the quantity of tomatoes needed. However, I added extra caramelized onions, and those were a standout feature of the dish! Amazing! I MUST send you some major praise... 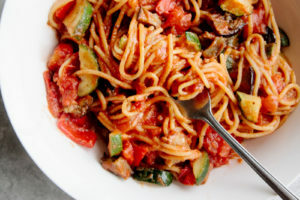 The consistency of this dish is AMAZING, and the recipe is SO EASY :) Thank you! We've tried with olives and it worked really well also. I've also jazzed it up by throwing in small cubes of Sainsbury's 'Free-From Greek-style' (vegan cheese / Gary) and it was amazing. 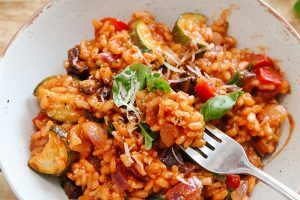 I love just how versatile this recipe is! Hi there any ideas on what to serve these delicious minis with? Hi Mags, I like to eat them just as they are, as a snack. But you could serve them with a leafy salad? Or as part of an afternoon tea spread. Made these this morning as a 'side' experiment while making Sunday brunch with the family. They were so quick and easy to make! I was a bit worried when I saw how wet the mix was - I thought maybe I'd misread the proportions - but, no, the result proved it was bang-on. So 'creamy' and flavour-packed. It took longer to soak off the residue and clean out the muffin pan, although I did oil it! Well worth it. I will be making these constantly now, I suspect. They are also the perfect snack food for my daughter's daily packed lunch. Love them! Q: Do you think I could use cupcake liners in the tin to help with clean-up? Thank you so much for letting me know, Shelley! So pleased you enjoyed them as much as I did :-) As for the cleaning up... well, I use a non-stick pan usually but if not, it's unavoidable that there is going to be a few dried bits. I tend to just let it soak for a while then it comes off very easily. Cupcake liners could work but not tried it myself. That's a good idea though! I am thinking of making these for a potluck I have at work - have you doubled or tripled this recipe yet? Looks delicious! Did them last night. They are so delicious! And so easy to make. These sound heavenly! You've packed a ton of savory flavor into a cute little package! 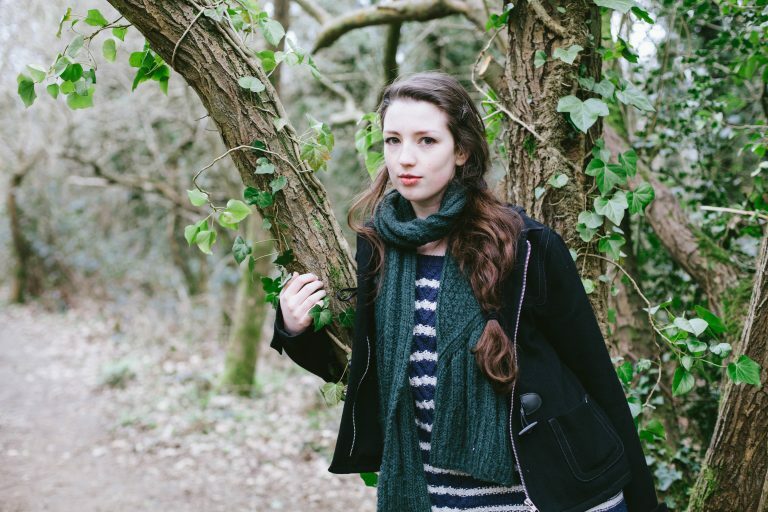 Thanks :-) You need to check it out, Hauke! Chickpea flour can be used for so many things. Am I able to sub chickpea flour with plain flour or any other flour or will it not work? Hi Ella, I'm afraid the chickpea flour or gram flour is crucial in this recipe. It's quite unique in it's egg-like texture so I don't think there is anything else you can use. If you're having trouble finding it in your local supermarket, try a health food shop or asian supermarket (you can look for gram flour, besan flour or garbanzo bean flour.) Hope that helps! These look so delicious! I could eat this everyday! 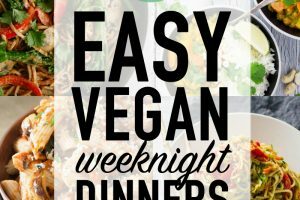 Super easy to prepare which is my favorite way! 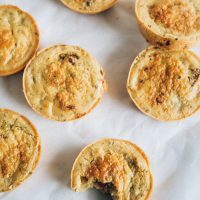 These baby quiches make a great quick breakfast and would be fantastic on a cake stand for weekend brunch. I love the fact that they're only 35 calories each! I can eat six! these are portable..and i love anything that i can eat while traveling/driving. These are SO cute!! I love mini foods. And I love the flavors in these!